I'm so amped on this feature which Surfline put out two days ago. Inside you will find some seriously good shots from a handful of Florida's finest surf photographers. Also, I am very excited about the interview they gave me in this feature. It's a pretty wild feeling being included with Surfline's top photographers. Stoked is an understatement, blessed is a good way to put it. Shoots Boiz I can't wait for some swell! Two weeks in Southern California. Well its June and that means that most serious u18 surfers will be in southern california this week for the Surfing America Championships. Stoked to say that I am here as well. Its a pretty fun time of the year to shoot at Lowers when all the kids are surfing their brains out. I've been here for a couple days now shooting and have covered a bit of the Volcom TCT a couple lay days, and am now looking forward to the start of the nationals tomorrow. its going to be an exciting few days as some of the best up comers rip into North America's greatest wave. Here's a glimpse of what I got so far. Kolohe Anding putting on a clinic at Lowers, San Clemente, CA. Griffin Colapinto blow tail at Lowers, San Clemente, CA. Groms frothing on overhead sections. The groms watching Kolohe rip into a wave, dreams are born here. Chaunchoo tore into his heats during the Volcom TCT, bummer to see him put out in QF, still a great result earned by hard work. Playing around in San Clemente. Chauncey Robinson killing it with the panoramic. Thanks for the pic man. Roof top views in-between surf comps. Donuts are flowing pretty heavily, special thanks to Surfin Donuts for all the fuel. Only one way to burn off some donuts and that's by surfing. Matthew Glenn under the cliffs at State. Tough to see at a first glance but Matthew Glenn is tucked into that barrel, he even sneaked the doggy door. Chaun and his man turns. Evan Brownell throwing it up in a punchy beach break. This North Florida surfer rips. Speed ollies with Matthew Glenn. Water Spots and the boys. Back to Lowers and sessions with the groms. A small gallery from a fun evening session at Lowers. Good to see Blake Spier here and shredding. Chase Modelski with a big tail blow. Its always fun here, and I'm really looking forward to this week. We have some solid swell in the forecast with the possibilities to really score. I'm hoping some serious work can get done starting at 5:30 am tomorrow. Keep checking back for more updates as this trip unfolds. Sebatian Inlet with Tommy and Chase. Its already been a couple weeks since we had a decent day of surf, these summer lulls are setting in and its making my head hurt. On the other hand its been awesome to get out and fish, explore more of Florida while the ocean lays flat, which has really been the reason this blog post hasn't happened sooner. In that, these shots are from a fun day spent at Sebastian Inlet with Tommy Coleman and Chase Modelski. Also there are a few good images of surf coach Michel Flores and and South African Rigard Smit. They surfed, we fished, we surfed some more soaking up every bit of swell we could before this long flat spell. Check it out. Chase Modelski is a ripper! Hard to believe I haven't linked up with him sooner, but glad I have now. South African Rigard Smit enjoying the tropical temps of our florida waters. Tommy taking care of close outs. My daughter River hanging out with me on the beach. Its pretty rad to be able to bring her to work. She's styling some VonZipper's and a lot of SunBum! There's only one person I have ever seen rip tiny waves apart like Tommy Coleman, and that is his surf coach Michel Flores. This Brazilian knows how to get performance out of his surf boards in every condition. Chase Modelski reminds me of Chauncey Robinson. I'm seeing a lot of similarities in the way these guys surf. When your surf coach goes upside down. Michel Flores trying Brazilian aerials. Afternoon Sessions in board shorts. Chase loving some spring time air. Tommy's backhand snap is ridiculously dangerous. And his fin release moves nail are sure to grab attention. I haven't seen Blake Spier much lately, looks like he is always heading to cool places on planet earth, stoked to link up with him on this classic Sebastian Inlet first peak air revo. Since I was shooting from the beach I figured I may as well make a short edit. Tommy Coleman has his air revo's on lock making this easy. Tommy Coleman at Sebastian Inlet_ May 2016 from Nathaniel Harrington on Vimeo. That's all from one day. So much fun. Thanks a lot for checking into my site, hope you enjoyed. This spring I went on a trip with Brock Taylor and my wife Tatum. 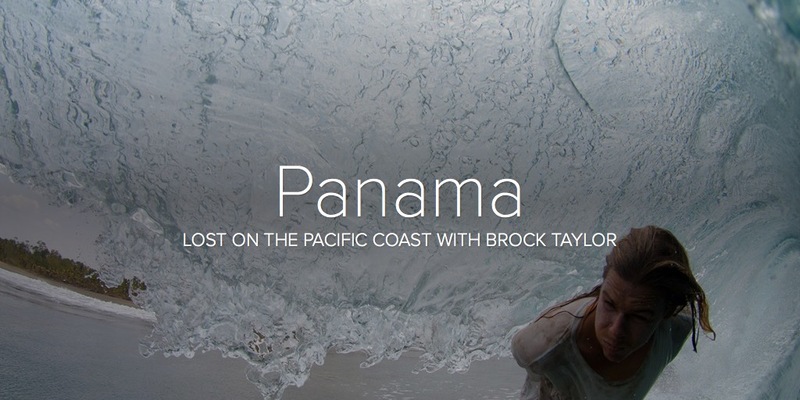 We headed down south to Panama where we enjoyed a blacksand beach, fish tacos, and some pumping surf. I created an Adobe Slate to tell the story as well as adding a video edit from the help of Tatum. Enjoy and thank you for visiting my website.